Paramount Home Entertainment has announced they will be launching their centennial celebration in 2012 with the January 24, 2012 release of the meticulously restored 1927 World War I classic Wings on Blu-ray and DVD for the first time ever. 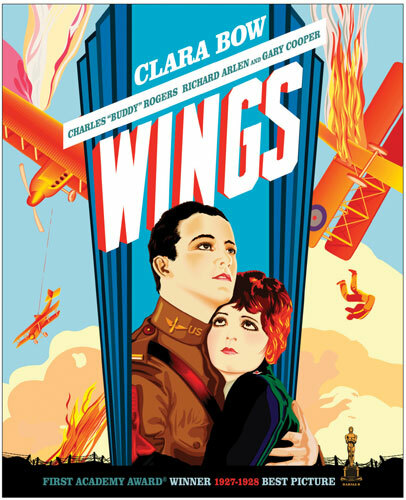 In 1929, Wings became the first film to win the inaugural Best Picture Academy Award. The Wings Blu-ray includes the new documentaries “Wings: Grandeur in the Sky,” which gives perspective on the remarkable cinematic achievements of William Wellman and his team of filmmakers; “Dogfight”, which explores the history of early aeronautics; and “Restoring the Power and Beauty of Wings”, which details the painstaking process of returning this monumental epic to its original glory. The Wings Blu-ray will feature 1080p high definition video with a newly-restored musical score by J.S. Zamecnik in DTS-HD Master Audio 5.1 and an organ score by Gaylord Carter in Dolby Digital 2.0. The disc will sell at a suggested retail price of U.S. $29.99. January 24, 2012. Meticulously restored to give fans the chance to view the visually stunning epic in pristine condition, the 1927 World War I drama explores the devastating effects of war through the story of two men who go off to battle and the woman they both leave behind. Featuring groundbreaking aerial dogfights and epic battle sequences, WINGS is both a cinematic spectacle and a compelling story of love and sacrifice that effectively dramatizes the bitter wages of war. The historic piece of cinema stars Clara Bow, Charles “Buddy” Rogers and Richard Arlen, and also features Gary Cooper in one of his first feature film roles. At a time when few films cost as much as $1 million, WINGS’ budget soared to an extraordinary $2 million. But the investment paid off when the film opened and became a resounding hit, playing for over a year at its original New York engagement. And in 1929 WINGS became the first film to win the Academy Award for Best Picture, as well as a second Academy Award for Engineering Effects, now known as special effects. For this release, the film’s original paper score was procured from the Library of Congress and recorded with a full orchestra. Like many silent film scores, the music was a combination of original composition, popular songs of the period and themes from classical music. Musicians with expertise in silent film music were chosen to recreate a truly orchestral experience.